I’ve never been to this particular place before, but I instinctively feel it as familiar. I’m at a rest stop in Ellinger, Texas, on Highway 71 between Austin and Houston. I stand at the edge of the small parking lot, on a curb that gives way to a shallow ditch that runs alongside that empty road that passes by green fields and that seems to end at the horizon a couple hundred feet away. Even in mid-September, the heat rises from the road in shimmery waves, the exhaust from cars on the highway and in the parking lot adding to the 90-degree air temperature. 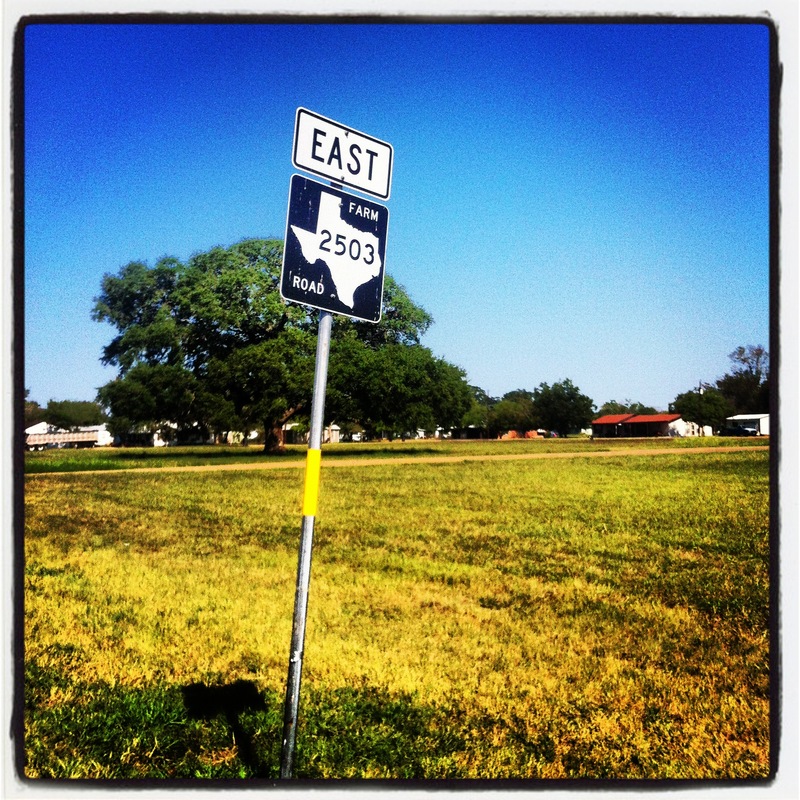 The empty road dead ends into the highway, and across the intersection the arrows of two black-and-white signs, both with “71” inside an outline of the shape of Texas, point in opposite directions: north and south. A few abandoned tin-walled structures sit behind the wooden fence that separates highway from field. Back on my side of the highway, three signs give the distances to the local Baptist, Lutheran, and Catholic churches, down the empty road that must become fuller past the horizon. Another sign advertises pecans for sale beyond the furthest church. Peh-CANHS, I think. That’s how we say it here. Not PEE-cans, as they do elsewhere. Walking across the empty road to take my photograph, I see an enormous white canvas that the church signs have obscured. “Romney-Ryan 2012” is backwards, since the logo faces the highway. I wonder whether it sits on public land at the same time that I know that few will care. This stretch of highway and this empty road is red. Small white clouds only intermittently dot the expansive blue sky, which I always think seems bigger in Texas. Or was I just taught to think it so? Would I really recognize this landscape as Texas if the outline of the state were removed from the road sign? I am a Texan, but I haven’t lived in Texas in 12 years. And there’s a chance that I might not again. When my nephew was born, the hospital gave his parents a discharge sheet congratulating them on “the birth of your new little Texan.” Will my children be so-called? What does it mean that he is a “Texan”? What does it mean that I am? I love my family and Tex-Mex and Shiner Bock and Longhorn football and Astros baseball and bluebonnets and mesquite trees and the hill country and the car ride from Houston to Austin on a hot day. I don’t love the death penalty and retrograde politics and homegrown presidential candidates and heat and humidity and traffic and suburban sprawl. I’ve become an East Coast urban Jew, like my husband, and so much of my former home has become an anathema to me. And perhaps I have become an anathema to it. Molly Ivins said, “I dearly love the state of Texas, but I consider that a harmless perversion on my part, and discuss it only with consenting adults.” She knows the mixed feelings that come with loyalty to a state that is often easy to deride as buffoonish. How can I be homesick and horrified at the same time? Who were they, and to what and whom did they belong? Or was the idea of belonging itself a trap, a cage from which they had been lucky enough to escape? He had concluded that the questions needed to be rephrased. The questions he knew how to answer were not about place or roots, but about love. Who do you love? What can you leave behind, and what do you need to hold on to? Where does your heart feel full? He is surprised when a writer still living in India explains that his writing, that of a native son, is “highly problematic” in the country. I claim Texas, but would Texas claim me? As I fly back to Boston, it doesn’t feel like home. I like it, and I may one day grow to love it, as I did D.C. I think that home is Texas, and I always leave a part of me there. It’s a part that wouldn’t know what to do in Boston. Rushdie calls this migrant consciousness. I moved because I couldn’t do what I want to do there. So I’m here now, and I am grateful and blessed. But the move required the construct of a new identity. You can’t ever go home again. My parents have lived in Texas for more than 40 years. My grandparents were born and went to school in Texas – and moved back in retirement; my aunt and uncle did the same. My cousin moved to Madison after college for graduate school and then work and moved back several years later. My brother never left. Re-entry into my “real life” has been very hard this time around. Enrollment in rabbinical school has amplified the differences between who I was and who I am. Will I ever feel whole in either place? Jeez! You’ve really hit it on the head with this one, Salem! I feel damn-near the EXACT same way about my little corner of the Gulf-Coast of Florida. So many parallels to the things you touch on. Gave me the chills for a second. I don’t think I could ever “go back” permanently but it will ALWAYS be “Home”. Thanks, Jeremy! It makes me feel better to know that I’m not alone in feeling this way.